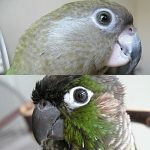 Parrot Forum • View topic - Exciting stuff! So I probably have been overly cautious with Nika ever since day two, which I think has actually turned out for the best because she always exceeds my expectations! and her behavior is always way better than I expect too! So probably three or four weeks ago she really started flying, even though she has been flying periodically (after much consideration each time) for three months or more. I had tried three months ago to have her recall to my hand maybe a six inch gap but her fear resulted in quite a few fear bites (not wounds, but definite bites)! So I stopped trying for a long while. I started to target her from my hand onto her play perch, probably a couple feet and did very minor attempts to get her to recall onto my hand from her perch, maybe a foot. However just today I started real recall flight training and she excelled!!! Her confidence and skill is remarkable for a parrot who may have been clipped for years. We probably went from four feet to ten feet away! She did so wonderfully in both directions, to my hand and back! She's really shaped up with serious behavioral training and a fairly strict routine. She is extremely treat oriented and does pretty well with a lot of training. She does take a long while to catch on though, but that could be because she probably hasn't had no training until she turned six and met me. congratulations on your flight recall progress with Nika, and all the other behavioral work your doing!! isnt it amazing how flight recalls build confidence? my GCC had serious insecurity and clinginess problems last fall (and bad aggression before that) but flight recall exercises have helped SO MUCH. he's stopped biting, and he's finally learning how to be independent again. if its any one thing that i would say has helped with everything i've gone through with him since last summer, I would say its the flight recall exercises. That's fantastic, well done you two! I've been so impressed, reading your posts about Nika, about how much you've worked with her and hung in through the biting which can't have been easy at times. Recently you were saying you were feeling like a bad bird parent but I think you've been amazing and bringing her along with her flying and flight recall is just more evidence of that. Congrats! I am sure she will just continue to improve and improve with time =)! That is very exciting! Isn't satisfying to work with an animal and finally see it pay off? Well done. I fly my GCC quite a bit and found the same as Friend2Parrots in that he's less clingy and bitey. Flying is so good for a bird psychologically and it's also very beautiful to watch. Thanks everybody :] I love watching her fly or when she stretches her wings. An unaltered parrot is really a pretty thing. I think the trust we have is what limits the biting (though apparently not completely eliminates it). When she was teaching herself to fly she was actually crankier in certain aspects, I think because she was nervous and upset that she couldn't do what she wanted. She's still not overly confident but is definitely doing a good job. It's pretty amazing how well she's doing considering she may have been clipped for years. I know your poi is having confidence issues but he'll get there. This thread makes me happy. Well done Eurycerus Well done Nika.